"On the goo-ood ship, Lollipop..."
Shirley Temple, the darling child star of the 1930s takes center stage as the daughter of a housemaid, whose husband, a fighter pilot, was killed in the war. A film like Bright Eyes could never be made today; the innocence and freedom even I enjoyed as a youth is gone. This depicts a far simpler and innocent time, when a five-year-old girl can hitchhike on her own, not afraid to be picked up by strangers. 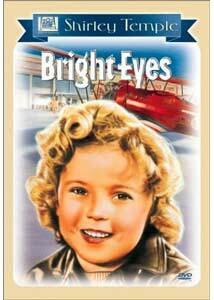 Shirley Blake (Temple) spends her days hanging around the air field, where her godfather, and her father's best friend, Loop Merritt, and his fellow aviators enjoy the young girl's company and frivolity. Her mother works for the Smythes, a greedy and selfish couple, who are counting the days until their benefactor, Uncle Ned Smith, sheds his earthly coils and bestows his wealth on them. The animosity between the crotchety old man and his nephew is reciprocated in kind, and extends to the couple's daughter Joy (Jane Withers), a miserable spoiled brat, but Shirley has found a soft spot in the old man's heart, much to the chagrin of his vulturous relatives. As a Christmas present, the aviators have decided to give Shirley a ride in an airplane, something she has always dreamed of. When the girl's mother is run over by a car on the way to the party, she is orphaned. The Smythes are content to ship the girl off to an orphanage, but Loop decides to adopt the girl; however, he is challenged by old Uncle Ned, which leads to an unpleasant custody battle. Bright Eyes features Temple's most famous number, On The Good Ship Lollipop, which may come as a bit of a surprise to those new to the film, as its subject is a plane. While Shirley does the cutesy performance to a "T", she is often upstaged by the other child star in this picture, Jane Withers, who was making her feature debut. There is plenty of hijinx, and drama throughout, with Shirley winning the hearts of all those around her. The villainous heirs are well played and humorously given their comeuppance. With its sugar coated ending, and sincere, if somewhat melodramatic performances all around, the film succeeds in delivering a heart warming story. As a testament to simpler, more innocent time, at least in Hollywood's view, Bright Eyes is a reminder that not everything has gotten better with progress. Image Transfer Review: Bright Eyes is presented in both its original black & white and a colorized version, and frankly, neither looks very good. The black & white version is sourced from an extremely grainy master, which also exhibits a lot of flicker and gate wobble throughout. The grain level is worsened by the compression artfacts it produces, as its structure jumps around unnaturally within the frame. The image is very soft, and often murky. While grayscale rendition is adequate, as one of Fox's biggest assets in the 1930s, this is a big disappointment. The bastardized color version doesn't fare any better, looking flat and washed out, with very dirty fake color. Yuck. Audio Transfer Review: The soundtrack is available in stereo or mono—I could discern no difference in the two in terms of imaging. Audio is sufficient, with few source defects, but understandably limited frequency response. There is a persistent edginess inherent in the track, but it is not overly sibilant. Extras Review: I suppose the color version could be considered an extra, but nothing else is included. Shirley's flagship song highlights this sugary tale, but the actress is upstaged by the tantrums of costar Jane Withers, who would go on to rival popularity. The transfer here disappoints, no help to the inclusion of the later colorized edition.